A new launch with permissions (excavation work started) from Kalpataru builder at the most sought after, highly appreciable micro market- Powai. After Hiranandani, Powai has seen remarkable developments from builders like Nahar chandivali, K Raheja at Raheja vihar, Shapoorji and L&T which has continued to make this area more habitable and appreciable. Located next to Dmart nahar amrit shakti, Powai today boasts of best of schools like Bombay Scottish, Hirandani foundation, Podar & Nahar International schools with all sorts of amenities like reputed hospitals, 5star hotels, Corporate and recreation, besides having close proximity that Kalpataru Woodsville powai residents can enjoy like International airport being just 5 Kms or Ghatkopar metro being just about 2 Kms. 2BHK starts from 1.91 Cr+ and 3 Cr+ for a 3BHK spacious flat having carpet area of 750 sq ft & 1200 Sqft respectively with all modern amenities like Gymnasium, Swimming pool, Garden etc. This is going to be a single luxury tower, ready for possession in next 2 years. Kalpataru woods ville price is fairly lucrative given market rates in powai hover from 20,000 upwards for ready and 17,500 for an under construction flat. 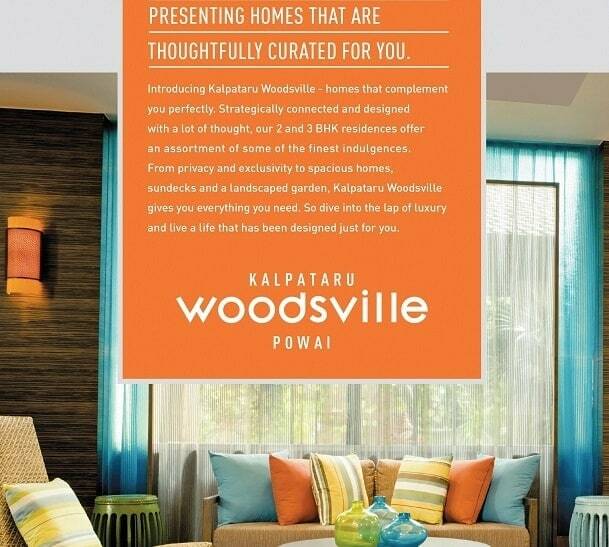 Kalpataru woodsville powai has two types of flats- 2BHK & 3BHK Spacious ranging from carpet area of 750 to 1200 Sq ft.